Contributing Authors: Gayle Lynds, Rita Mae Brown, Marcia Talley, Lisa Gardner, Linda Fairstein, Kay Hooper, Kathy Reichs, Julie Smith, Heather Graham, Jennifer Crusie, Tina Wainscott, Anne Perry and Katherine Neville. Thirteen of today’s hottest female crime novelists – one thrilling mystery, a whodunit in the tradition of Naked Came the Phoenix. On the banks of the scenic Truxton River, nestled in rolling woodlands just minutes away from our nation’s capital, lies Gryphon Gate. Drawn to its breathtaking view of the Chesapeake Bay, Henry Drysdale selected this waterfront location to create a premiere gated community where the affluent and privileged residents live, work and play. Tempers flare when Vanessa, Henry’s ex, decides to build Forest Glen, a 300-unit condominium development on an adjoining tract of land. The Gryphon Gate town meeting disintegrates into a free-for-all as environmentalists, developers, residents and the media clash. Then the violence turns ugly – a body is found in a sandtrap off the 6th tee. Called in to head the investigation, Police Captain Diane Robards races against the clock to sort her allies from her enemies, as together she and an odd-ball cast of characters attempt to uncover the secrets behind the serene facade of Gryphon Gate and unmask a dangerous and ruthless killer. 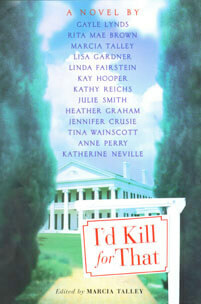 From the best-of-the-best in female mystery authors comes a highly enjoyable, rollicking tale of murder and mayhem.